Highly concentrated, ecological cleaning agents (up to 5 times more concentrated than regular products) and effective dispensers for all daily professional cleaning in buildings and kitchens. The dispensers prevent overdosing and guarantee an exact dosage every time. No electricity or water connection needed. Because we use clear colours, numbers and symbols the system is easy to use for everyone. The compact and highly concentrated pouches are easy to handle. With just 3 products all daily cleaning activities can be done without compromising in cleaning quality. 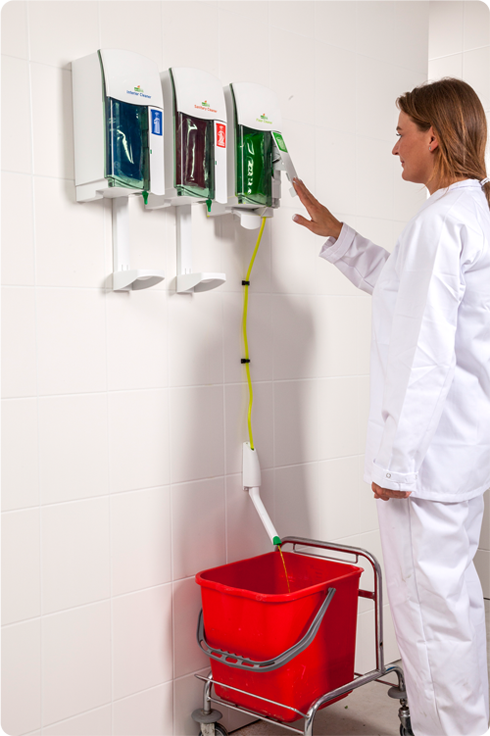 We train your staff how to use the dispenser and products. And maybe even more importantly: we train them how to work more hygienicly, safely and environmentally friendly. Because the products are so concentrated, less transportation is needed, your stock can be lower and waste is reduced to an absolute minimum. The pouches will be emptied completely. Product theft is an issue in the cleaning industry. Our products can, however, not be used without our dispenser, so theft is useless. Once safely installed in the dispenser, a pouch can only be removed with the use of the special key.